"I Can No Other Answer Make"
Today I taught my last Friday Nia class at the YMCA. I've been teaching this particular class for eight years. Eight years! But I didn't have the numbers anymore, and it didn't make good business sense for them to keep it going. I get that. When I was younger, I got a bit more freaked out about things ending. Now, I just try to be impressed that whatever it is lasted as long as it did. Because eight years is a pretty long time to do anything. I only had two students. I've known both of them for many years, since I started doing Nia, so it was fitting that they should be there. They're very good followers, and dance with a lot of joy, so they made it fun for me, too. I really put my all into each cue and movement, since it might be a while before I do it again. And I danced with awareness today, since only hours earlier I got the news I've been waiting on for nearly a month. Well, it wasn't quite the news I'd been looking for then--back then I just wanted a cure for my intermittently throbbing belly. I asked about this throbbing at my annual exam, and my doctor said he'd send me for some tests because he "wanted to make me happy." Well, of course. Doesn't everybody? The next day I had some blood drawn. Over a week went by and I didn't hear anything about the exam or the blood. But he also sent me for an abdominal ultrasound, to check out that belly pain, and I had to wait a few days for that appointment. I was pretty nervous about that one. I mean, it was at the hospital, but even more alarming, they said "Ninety minutes before, we need you to drink 32 oz. of water." Wait. What? I said I could never do that in a million years. Eight ounces, maybe. And, like, 10 minutes before. They said I had to do it anyway. I did my best. I guzzled in the car, in the waiting room. The tech was a sweetheart. I was on the table a long time (she did let me run and pee after the first five minutes) but there was no discomfort. The gel on my skin was hot. I hadn't expected that, after seeing it in movies. It seemed like she was taking pictures for an hour. That's because she was. When I got home, I cried a little. At the time, I thought it was from relief that it was over, but now I realize it was dread of what was to come. Because I knew something was to come. Two days later I was pulling into the parking lot at the mall when I saw my doctor's number light up my phone. I called from the dark parking garage. The woman on the phone was cold and clinical; she said three sentences: "You have a complex ovarian cyst. It's protocol to have an OVA-1 in these cases. Which lab would you like?" I couldn't even hear her after that. I got off the phone but I don't remember how. All I heard ringing in my ears was "complex" and "OVA-1." I didn't know what either meant but neither sounded any good. I called David. He Googled OVA-1. That was not good, either. It's a cancer test. I freaked. I mean, I FREAKED. Hyperventilating, sobbing, panic attack, in the parking lot. This was it. This was how I was going to go. I asked David to come home. He did, immediately. He met me in the park and hugged me while I talked to my Dad on the phone. (If you don't know, my dad is an OB/Gyn.) My Dad was awesome, as always, in these situations. He's not warm and fuzzy, but his combination of pragmatism, experience and vast knowledge go a long way towards calming a girl down. He assured me that the bloodwork would put all my fears to rest. I talked to my doctor. It was actually TWO cysts, one on each side. Smallish, both of them, but not tiny. David picked up Jarrah while I drove myself to yet another hospital building for the blood draw. I didn't have to wait; there was no one else there. The tech said "How are you?" and I opened my mouth to say "Fine," I really did. Instead, I sobbed my head off while she held me. That's right, I was hugged by a phlebotomist. I doubt many people can say the same. I went home. I was numb. I stayed that way--at least during business hours--for the next two days. Friday after 5:00 I relaxed a little, since nothing horrible could happen to me if the doctor's office was closed. Meanwhile, I was relying on my own version of Mother's Little Helper to sleep at night. Thank goodness for that. Because you know what? Life goes marching on. There's still laundry, and dishes, making lunches, reading stories, calling plumbers. Ah, yes. The plumber. Not only did I lose my job in the middle of all this, but our brand-new, beautiful bathroom sprouted a blooming field of water stains on the wall near the shower. After one month. Yikes. I was so numb I could barely muster any indignation. And that is a strange day in Mudville for me, as many of you well know. Then it was Monday, and it came and went without a call. My dad was checking on me (along with certain amazing, dear friends--thank you, thank you) a lot and by now had decided my results were lying on someone's desk somewhere. He urged me to contact them. His clarion call was taken up by nearly everyone else in my life. Call them. Call them. I received a number of texts saying that and only that: CALL THEM. Readers, I couldn't. I. Could. Not. Why, you ask? Don't bother. I don't really know, but it was about as visceral as my loathing of cottage cheese. As long as I didn't call them, none of this was really happening, since no one was there to say it out loud. Tuesday I could tell it was getting ridiculous. Lab tests take two days, three tops, right? We were now going on six days. I called. And the nurse told me "Oh, we don't have that back--we have to send it out of state. It takes 7-10 days to get results." Um...did no one imagine that was relevant information to share with ME? I must have sounded pretty something-or-other because a half-hour later my doctor called. "These results are borderline," I heard him say. Borderline? Borderline? Keep on pushing my love over the borderline? I couldn't even hear him now. Where was the all-clear, the no-worries, that everyone and everyone kept promising? This was not it. My doctor was now ordering an MRI. Someone would call me. I called my dad. I was sobbing and hiccuping so much it's amazing he could hear me. My dad--did I mention?--is awesome in these situations. He said he would research the issue. And he did. Turns out there is not much real-world data for this test, as it's very new. Know this if anyone ever wants you to take it. Various other factors I'll exclude for the sake of ethical discretion suggested that my "score" might not mean that much. But within the parameters of the people who made the test, it meant something: I hadn't passed. Now we needed more information. If I'd been worried before, I was now...what was I? I went almost robotic. I would get through each day, doing what I needed to do, hyper-conscious of loving who I wanted to love and being who I wanted to be. This might be my only chance to do those two things. I put my head down and focused. I still erupted in tears occasionally, but only at moments when I felt really safe. That same afternoon, Jarrah and I were in Target, shopping for her Halloween costume and getting supplies for an art project I was going to assist with in her class the next day. (See? Loving. Being. Head down.) The MRI center called, and weirdly--I thought--had appointments available the next day, and that very night--like in two hours. I grabbed the latter without hesitating. Why? Because I was totally, absolutely, freakin' tired of anticipating stuff. Whatever it was, no matter no horrible, I wanted it done and over. 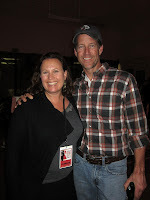 My friend Grace--bless her--picked up Jarrah so David could take me. It was all very interesting. The two techs may actually be some sort of angels sent to earth to make sad, worried people feel uplifted. Because I was with them for over an hour and they were the kindest, gentlest guides to a bizarre new experience I've ever had. Have you ever had a MRI? I hadn't known about the shot part. They need to squirt contrast in you, to get a better look. Or about how insanely loud it is. I had headphones with some sort of ghastly soft jazz, but I could barely hear it over the jackhammer-like din. But the weirdest part of all? The heat. I actually thought the machine was burning me up. Turns out I was burning myself up, or at least my protons were. Weird. The most surprising thing is that I didn't get claustrophobic (this from the girl who has sworn off all caves for life.) I'm sure the Xanax and the washcloth over my face helped with that. And speaking of angels? My husband stood touching my shoulder for nearly an hour while I was in there. He later told me that was the only part of me he could reach in the tunnel. I'm glad I only knew that after. Afterward, I felt strangely brave. I had been crying and getting bad news most of the day, and I'd still volunteered to go to the hospital that same night and lie in a hot tunnel for nearly an hour. I was proud of myself. For the first time in weeks, I had a lull in the terror. I ate an obscene amount of dinner and slept like a baby. Starting the next day, I jumped like a gazelle every time my phone made a sound. I waited through two days--nothing. It was Rosh Hashanah. Maybe my doctor was busy praying? But I knew one thing for sure: I was not, not, NOT going to go all weekend again with no news. I didn't have to. This morning (Friday) my doctor called. I missed that call. I sat there with my heart leaping out of my chest and called him back. He was busy--could he call me later? I whispered "okay" and then sat there staring. If my phone hadn't chosen yesterday to die and I didn't have a new "refurbished" phone, I might have noticed there was a voice mail. But instead, it took me nearly a half-hour. I listened to it. My doctor said he wanted to go over my MRI. Right, right. "But no bad news. Everything's perfect." I had no idea what that meant. What was perfect about my ovaries having growths on them? But I put down the phone. And Readers, I sobbed. Suddenly, totally, luxuriously. No bad news. I called David. I was crying so hard he probably thought the worst. Eventually, I called my doctor again. I was sick of waiting. I'm SO OVER waiting. Now I wanted the news, all of it, NOW. So, the cysts are the ordinary kind. Nothing to see; move it along. We will repeat the MRI in three months to make sure they've gone away. Oh. Only one problem. Remember my pain? The reason I came in? It's still there. It's even a bit worse. Oh...well. There was some talk of surgery, but why do I want surgery for something that can resolve on its own? Some mention of hormones, which may or may not help. Ugh. That was that. Both my doctor and my dad were eager to get back to their busy days. As my dad put it, I'd "ceased to be an interesting patient." My tummy hurts. I'd like to get that sorted out. But I took a shower (in our brand new bathroom now sporting a massive hole in the wall) that felt like a million bucks, got dressed, and went to meet my friend Phoebe for lunch. She treated, to celebrate my good news. It was a beautiful day. My lunch was delicious. She made me laugh. Everything seemed a little sunnier, a little breezier, a little bluer and greener and golder. I gave my gorgeous girl a big kiss when I picked her up at school. Danced my heart out in my last Friday Nia class. Smiled at everyone. Said thank you and meant it. We had an impromptu get-away to Temecula this weekend for the Temecula Valley Film Festival. Our film Sublime Intervention was screening there as part of the 48 Hour Film Project showcase, and we had All-Access Filmmaker passes. Readers, this turned out to be the most delightful mini-break. So delightful, in fact, that I've since suggested we make it an annual event, even if we don't get a free ride. Because Temecula is still an emerging film festival, there are no crowds, no lines, no heartbreaking shut-outs like we experienced at Sundance. If you find something on the schedule you want to see, you're in, and often with the extra-perk of a cast and crew Q&A afterward. We were really impressed with the quality of the films, and I just love being able to flash my badge anytime I feel like going into the magical Hospitality Suite, a storefront near the theater transformed into a cushy artist lounge for the duration, filled with swag, alcohol, movie candy and entire meals (including homemade cookies and cake) absolutely, positively FREE if you're wearing that all-powerful lanyard around your neck. The Hospitality Suite is also the site of the parties, held every evening, to honor the filmmakers and even some celebrities in town for the premieres. More on that anon. We arrived Friday afternoon in time for a lively and delicious Italian dinner courtesy of Deo Volente Media--husband and wife team David and Dawn, and charismatic frequent star Maurice--as well as Robyn and Duane, who's the head programmer for the festival. I had so much fun hanging out with them, and especially getting to goof around with Maurice, who dazzles me a bit since I've been seeing him on the big screen for a few years now. We skedaddled into our screening in the nick of time, and were pleased to see a packed house. After, I was once again the only woman at the front of the theater (third time this season!) for the Q&A, which is a little weird but still fun. David and I got a kick out of going straight into another theater--love those All-Access passes!--to see Karaoke Man, a sweet, smart romantic comedy about a young man who dresses as a super-hero to sing in the karaoke bar where his love works. The film features mostly new talent, but we did recognize James Denton from Desperate Housewives in the role of the bar owner. When we came out, most of our crew was gathered outside, and the warm night was filled with the sound of live music--the festival also features up-and-coming bands and musicians. It all felt very festive, and we hung around until a bunch of people carrying buckets of ice let us know that the Hospitality Suite was open for party business. And here is where everything got all very Hollywood-ish. 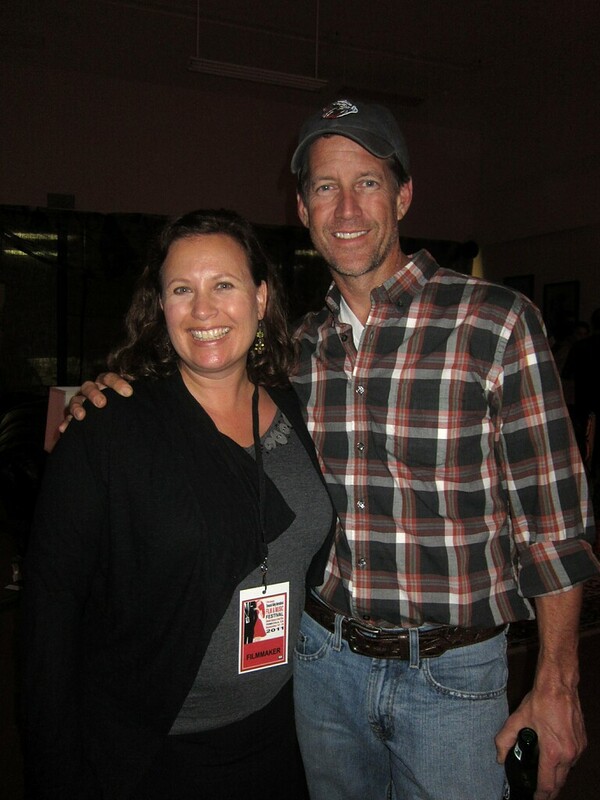 While we were milling around, Robyn pointed out James Denton, "Mike the plumber" from Desperate Housewives. For a second I was amazed to see him, drinking a beer in a baseball cap in Temecula, then I remembered I'd just seen him in the movie. Robyn said I should ask to take a photo with him. I responded that I have never been able to act normal around celebrities so no freakin' way. But then Duane was super-smooth and said he'd handle it. He introduced himself (he is the Lead Programmer for the festival, after all) and then--suave as all get-out--introduced a couple of his friends. Since I was standing there beaming like an idiot, I got to be one of those friends. Mr. Denton stuck out his hand and said "Hi, I'm Jamie!" seeming for all the world like a sweet guy who hasn't been on prime-time TV for eight years. We all chatted for a while--about his movie, and ours (!) and he told Duane he'd really like to see the 48 Hour showcase, if he could get a DVD (!!) since he'd missed the last screening. And Readers, I got brave enough to act semi-normal. He was talking about the speeded-up schedule on an independent film, and remarked ruefully, "It's a young man's game." "Tell me about it." I chimed in, and he laughed. Readers: He laughed!!! 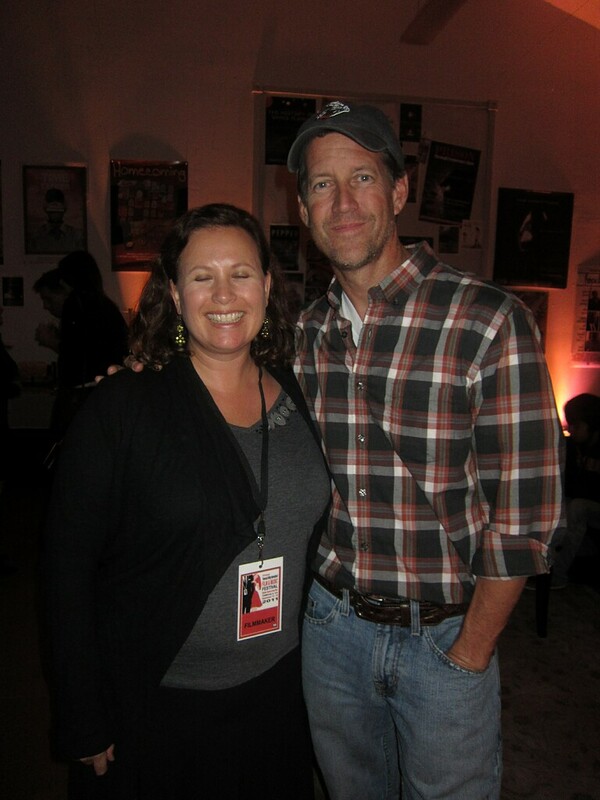 We took a photo, after which I noticed that my eyes are completely closed, and Duane followed him to report this. He came back immediately, with a big smile, and threw his arm around me with a booming, "Well, we can't have that, can we?" I tell you, the man is a prince among actors. 'Course, I don't know a lot of actors. The night made, it seemed only right to depart on a high note, so David and I left for the Marriott suites. Either our room was particularly inviting or we were just bone-tired, because we slept like we rarely do in hotels. After a (slightly less than satisfying) FREE breakfast, we were ready for Film Fest: Part Deux. We returned at 11:00 a.m. just in time for a documentary we'd heard about, Hollywood to Dollywood. Two adorable twin brothers, Gary and Larry, rent a RV they name "Jolene" and drive it cross-country to Pigeon Forge, TN to hand-deliver a script they've written for their idol, Dolly Parton. Hijinks ensue, and we encounter lots of colorful characters on the way. The real message of the film is acceptance and tolerance, and there wasn't a dry eye in the house. And it was a real treat to have a Q&A with the brothers themselves afterward--they were beyond excited to be sharing their film--soooo charming. Next we had lunch at The Public House in Old Town with Robyn and Dwayne, where the brisket sliders were divine and you gotta love the housemade (I kept calling it "house-churned") cream soda on tap with real vanilla bean-bits floating in it. Now the day was getting a bit steamy, and you know what's awesome to do on a hot, lazy Saturday? See air-conditioned movies. FOR FREE. Oh, yeah. Soon we were back to the theater for a feature called The Pill, a film with a frankly sexual premise that was really a rom-com with a difference, because it was smart and thought-provoking, and you could actually see the characters changing. The dialogue and the acting were tres sophisticated, and David and I liked it a lot. At this point, I was like "What's the deal with Temecula? Do they only choose good, interesting films, or what?" I'm not sure why this was so surprising to me. Now we were wanting to go straight into a star-studded feature called Mayor Cupcake, but alas, it was time to return to real life and go claim our child. Luckily, this was fun, too, since we got to have dinner with Mary and Paul and fill them in on the highlights of the weekend thus far. I say "thus far" because by now we'd somewhat recklessly decided to return the following night for the closing night Gala at Pechanga Casino, despite my repellent experience at the SDAFF gala a few months back. Readers, it was the right decision. For one thing, this time I wore a dress that wasn't mercilessly squeezing my organs. So already, the night was a winner. For another, Robyn and Duane scored us some VIP seats at some congressman's table, right in the front row. By the time I'd slurped two complimentary glasses of the Wilson Creek almond-flavored champagne (oooh, will be getting more of that) and spotted the illustrious Booboo Stewart at the next table (much mirth about this Twilight-starring young man throughout the night) I was in fine spirits indeed. After a surprisingly good meal, we were escorted to the Pechanga Ballroom for the "show." I hadn't realized there was going to be an actual show, though I knew there would be honorees and acceptance speeches. But after a lengthy wait, we also got dance numbers and and a slightly scary sister-act duo singing a repetitive song, during which they commanded us to clap. But I have to admit, the production values were high. We even got two hosts, who bantered in a way that may or may not have been determined by the TeLePrompter. The show was longish, because there was no orchestra to play anyone off, so not only did the recipients speak luxuriously, so did their presenters. And each honoree got their own "reel," ranging from mysterious (the first thing one honoree did upon reaching the mike was disavow any knowledge of the contents of his) to loving-hands-at-home (the series of slow stills set to a song for Connie Stevens.) Booboo Stewart thanked divine intervention and Temecula for his award, but mentioned four or five times that he was too nervous to make a real speech. Dude, there was no uncertainty this evening--you were getting a statuette. Write something. The best speech was courtesy of the lovely and regal Virginia Madsen, who was resplendent in a yellow dress and spoke movingly of the importance of independent film, and was introduced by her kvelling mother, who was nearly as eloquent. I've blogged in this Starbucks before, when I had a really, really terrible cold. And it's reminding me of two things: one, I haven't had a terrible cold in about eight months, and two, that I'm super-superstitious about jinxes. So here's me officially not mentioning anything about it. Trying to get my car in shape because I'm driving alone in rush-hour traffic tomorrow night to visit a couple Smith friends in the OC. One of them is from the East Coast, and the other from LA, but I haven't seen either of them in years. Should be fun catching up, eating Mexican food in Richard Nixon's favorite restaurant, and trying to limit myself to one margarita so I can sop it up with tortilla chips and be good to drive. This past weekend was the annual Chinese Moon Fest, which is my favorite event on the Families with Children from China calendar. For one thing, I'm a night person, so curling up with blankets and drinking hot chocolate with pals under a full moon is my idea of a good time. Also, the kids are super-adorable in the lantern parade. This year, I was a little wigged how much my girl is growing up--we've missed the Moon Fest for two years, so she was only 3 1/2 the last time we went. This time, I hardly saw her--she, Joy, Linda and assorted other members off her posse were off sprinting after rabbits and playing vampire for hours. And our neighbor--age 3--asked Jarrah where she was going as we got in the car. "To an event called Moon Fest." "What's an event?" asked Victoria. "I'm not sure, but I know it has to do with fund raising." "And when she bit into the fruit, everything went black and stormy and all the plants shriveled up and died. And Adam came around the corner and thundered 'What have you done???' and just then an angel appeared and pointed the way out with a bony finger." I think she likes the bony finger. But who knows? The kid is obsessed with death, horror and punishment these days. Don't look at me. 3:30 and not a creature is stirring after the Great San Diego Blackout of 2011. Of course, there are sounds, all the important ones: the fan over my head, the HEPA filter, and the oh-so-reassuring hum of my computer. Not sure why I'm up. It was a weird evening, but ultimately, a nice one. It started around 3:45 p.m. while I was puzzling over Pinterest (why do I not understand the internet?) and my computer went black with a sickening snap. Then I noticed the A/C was gone, too. Uh-oh. It was quiet for a moment, until Jarrah realized there was no TV, either. I told her we were having a brown-out. "Em...it's when everyone uses their A/C at the same time and it makes the power go out for a minute." Even as I said this, I realized I wasn't quite sure what I was talking about. A minute passed. Then five. Then 30. It started getting hotter and hotter. Not a great day to lose our A/C. I worried about the stuff in the fridge. I turned on my laptop. No wi-fi. (David laughed at me later, not sure why I thought there would be wi-fi.) I called David. Phone didn't work. This was my CELL phone, people. I texted him, and my friend Robyn, to see if I was crazy. Not crazy. Her power was out, too. Wow. Also David's, up in Solana Beach. WHA? This was obviously big. Jarrah was over it. "Can I use your computer?" I explained that soon we'd be in the dark, with only torches for light. I could tell this didn't penetrate. We'll just turn on the lights if it's dark, her face said. David texted, sporadically, when they went through. He'd left work early, but traffic was terrible and all the signals were out. It ended up taking him two hours for a drive that's typically 20 minutes. Meanwhile, Jarrah and I were sweating, and I clung to my phone like a life raft. I couldn't call anyone, and I had no internet, but occasionally I got a text with some illumination about the outside world. It felt odd, and exciting. When David got home, I realized we could cook the chicken I'd bought that afternoon outside. It was getting dark, but I lit some candles and set about chopping veggies, shredding lettuce and mixing dressing for my famous Chinese Chicken Salad. I could tell I was making all kinds of messes that I couldn't really see. I started pulling random stuff out of the fridge and offering it to Jarrah, figuring it would go bad soon. She said the situation "creeped her out" and we were not to leave her alone in any rooms. Fair enough. Dinner was held up for about an hour while David contemplated attaching a cable to his car to run my boom box, which takes a boatload of "D" batteries that we didn't have. Rats. Cables in the garage; garage not opening. "Good thing we don't keep our emergency preparedness kit in there. Not that we have one." I remarked. David said he was going to the store for batteries. "What if it's a lawless world out there?" "Then I'll come right back." "BE CAREFUL, DADDY!" shrieked Jarrah. Supermarket was closed, as expected. But he cheerfully reported that the liquor store on the corner was doing a bang-up business, illuminated by car headlights and a single candle. They were out of batteries already, but happy to sell him--cash only--a few bottles of water WITH A HUNDRED PERCENT MARK-UP. He found this funny; I found it appalling. "They're preying upon our neediness?" Dinner was dark, and good. As we ate, we listened to an emergency broadcast powered by the batteries from our torches. As predicted, schools were closed the next day, and various San Diego luminaries praised their fellow citizens for banding together in this "unprecedented" event. References to the 2003 and 2007 wildfires abounded. Eventually, they started the thing where they welcome the mayor's sister's fifth-grade teacher to the mike to talk about what this blackout would mean for our impatiens. That's when I suggested we conserve the batteries. We held flashlights for Jarrah while she brushed her teeth, and discovered a Chinese lantern (thank you, Mary!) that would do as a battery-powered night light. Took her a while, but she eventually fell asleep. David told me it was much cooler in the California room (screened porch.) We sat out there, and listened to the silence. He asked if I wanted an ice cream cone, and I said I didn't think I could eat dessert without TV to eat it with. We decided we could use five minutes of our hot water reserve to cool off before bed. Taking a shower by candlelight is not a bad thing. We were cozy in bed discussing the pros and cons of my Kindle book light when the power started up. "Oh," I said. It was a strange moment. Kind of like, Oh. I didn't know I was actually sorta enjoying that. And now it's over. Back to reality. Couldn't resist a quick perusal of Facebook on David's iPhone under the covers. Pretty much what I expected. Lots of people reporting the power was out. It was nearly 11:00. And I realized, for the first time in months, we were completely relaxed. All was quiet. Nothing to do. We went to sleep. About as low-tech as you can get. Today was Jarrah's first day of first grade. I'd like to give you details, but a certain someone is so jaded now that all I heard about was the chocolate chip cookies the teacher NEXT DOOR gave her kids. Though apparently chip-withholding, New Teacher is nice, classmates are nice (she made friends with a Jessica and a Hope) room is nice, and really, everything is nice. Next! The sticky continued into the afternoon, where we had a park date with Dani and Sophias' moms (I missed them!) and tried not to die of heat stroke. I'm referring to the moms, and all we were doing was sitting on a bench. It was just as hot when I drove to the airport to pick up my friend Claire, and we headed for Little Italy for some dinner and a glass of wine at an outdoor table. No jacket required, or really, any sort of clothing, had it been that sort of place, and the neighborhood was chock-a-block with scantily-clad revelers, even on a Tuesday night after Labor Day. It's been a long time since we've had such a steamy night. The type of night that leads directly to our next adventure. When I dropped Claire at Paradise Point, I was lounging on her couch and feeling jealous of her cool tiki-style casita when there was a dread skittering sound right next to my ear. A cockroach the size of a stylish clutch was scrambling up the wall. As I screamed (and screamed and screamed), I decided my house isn't so bad. Poor Claire, on East Coast time after a six-hour flight, struggled to stay upright while the cheerful porter whacked the walls with a towel and I cowered. Since I was trying to keep my eyes closed, I didn't see the intruder again until the porter came sprinting out the front door, bearing our little friend aloft on a couch cushion. Seriously, dudes, biggest roach I ever saw. Shudder. Just to balance out a beautiful night. A few readers have reminded me that I've been remiss in not posting a link to this summer's 48 Hour Film Project movie, so here it is! For those who aren't already sick of hearing it, our film won the Audience Choice Award at our premiere, and went on to win Best Sound Design and Runner-Up Best Film of 2011 at the Best of San Diego screening. We had so much fun this year, and I'm really proud of our little film, which will next be seen at the Temecula Valley Film Festival this month. If you're not wise to the ways of this competition, it kicks off on Friday at 7:00 p.m. and concludes Sunday at 7:00 p.m. All writing, shooting and editing must take place within the 48 Hours. The genre we drew this year: Romance. Line of Dialogue: "Please keep it to yourself." Sublime Intervention from David Newman on Vimeo. Melancholy morning. It's September, and though it doesn't really happen around here, I always start hearing "But I miss you most, my darling/When autumn leaves start to fall" in my head. This afternoon, I believe we can go see who Jarrah's new teacher will be, and I feel weird about that. I'm also feeling a bit blue that I had two really long auditions this week (one regular, one callback) but could tell during the callback that my star was falling, as the director read me--just once--for four different parts, when I'd only been called back for one. Not a good sign. I mean, it might mean he sorta liked me, but by the end, it also meant he wasn't going to cast me. I have another audition next week, but must confess that my excitement for these things tends to peak very quickly, and just as quickly plummet down the other side. I think I've started a bit of that. I've also had a few too many nights of greeting David as he returns from work "I'm getting ready! Don't talk to me! Find yourselves something for dinner!" before sprinting to the car, carefully constructed curls bouncing around my face, lips sticky with gloss. I had a bad dream last night that I was lost in a dark, dark city that was supposed to be Melbourne (seemed more like Italy) on a scooter, trying to navigate my way back to people I knew with an awful lot of hazards from cobblestones and twisty staircases. I was frightened and lonely, and when I opened my eyes, it seemed like it had been going on forever. Jarrah and I are both listless today, and she even shocked me by refusing the neighbors' invitation to the park. "Are you sick?" I asked, but she doesn't seem to be. The neighbors are also wanting to take Jarrah to church, which is a situation I haven't been in before. I feel like I wanna just say "Thanks, but we're Jewish!" so why don't I? It's awkward. Guess I'm just having trouble with summer ending. It's been a fast, crazy one, beginning with our Australia trip, followed quickly by the bathroom remodel and Comic-Con, diving into stand-up comedy, sliding into 48 Hours filming, screening and celebrating, and screeching finally into five auditions in ten days, so I guess I've become a bit of an adrenaline junkie along the way and am having trouble with the idea of structure and schedule showing up to spoil my party. But I know the fall will bring new adventures, right, Readers? Speaking of which, are you out there? A few people have told me they're having trouble accessing the comments--I guess if you are one of those you won't be able to chime in. I'll try to figure it out. In the mean time, thanks for stopping by--I appreciate you.